The euphoric feeling that happens when crossing the finish line at a marathon is completely indescribable. However, the pain incurred over the nearly four plus hours span can be very clearly described as painful, tough, exhausting, downright brutal. There is a particular John Wayne pattern of walking that happens immediately upon the sudden, halted footing (the aaaaaah moment, you’ve arrived, or survived…) when the leg muscles flare and the swelling sets in. The extensive walk from the finish to the UPS trucks that house grass stained pre-marathon bags (when walking strides were normal) is monumental. Thankfully most other runners muscles are as tense as the overworked UPS workers trying hurriedly to give back the gear to the tired, hurt, emotional, cold lot. The Quiet Man or Woman walkers continue to march forward, in sore muscle synch, in universal (yet ouched) harmony towards those big brown trucks, which seem seemingly, miles away. It is a feeling of utter elation to finally finish the race, gather your torn coffee stained bag and slowly blow out of dodge to warmer climates (taxis) or cheap transportation (NYC trains are free to Marathoners on the day.) Medaling only happens as a result of a lot of running preparation, and those universal and aforementioned muscles know the drill all too well. The peg leg climb down those subway stairs is just excructiating, and the squat to get into the taxi as agonizing. Training isn’t only about one run on any particular day. To log enough miles every week, to train for a marathon, there are a lot of long runs on back-to-back days that are necessary to build up the endurance needed to run 26.2 miles. The aches and the pains are par for the course. And with and without pain, I have run many courses. A few years ago, someone at NYCRR recommended compression leggings. They work by constricting your muscles, which reduces the amount of fluid buildup, and then decreases muscle swelling and pressure after a run. And they do just that. The tight gear isn’t salvation from soreness but it certainly helps. I feel less muscle soreness and fatigue than before I found these winners, and have noticed an ability to bounce back after a really long run and a marathon or two. These constricting leggings make for a really effective training run and ease the race pain across the finish. CW-X Patented Support System leggings features targeted muscle support in the quads, hamstrings, and calves which create a suspension system that maximizes movement efficiency during long distance running. 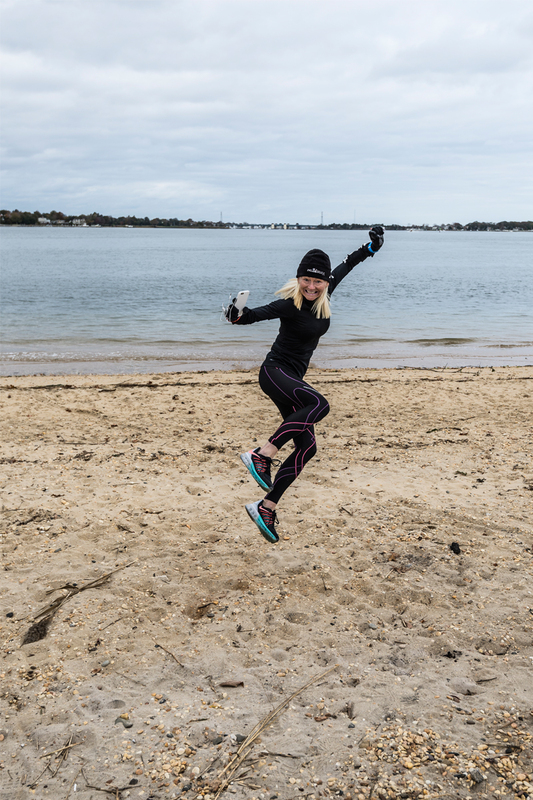 I wear these endurance generator tights all winter, not only for the warmth and the compression, but because they are really good looking leggings. As the Claire Underwood ‘vice presidential school of running attire’ is the desired look these days, (every one of her looks is desirable, right?) the part Nike/part CW-X all black look is very complimentary. And the monochromatic pairing of Nike’s lycra zip running shirts (with directions to JustDoIt!) and air max sneakers (worn over every finish line, in all sorts of colors) help to mask the dirt, the tears and the pain of a laborious run. The end result doesn’t seem so dark, so dreary, so unattractive. I shiver to report about the torture incurred when trying to remove these skin tight skins after pounding the pavement for hours – but I will, oh, I did. Suffice it to say that it takes as much time to get these appliqués off as it does to turn on the computer, Google a marathon entry form, fill it out, get the credit card for payment, put up your “Duke’s” and hit send. It takes the most seasoned runners, patience and a lot of ‘True Grit,’ for sure.